January 28, 2011  Not to be outdone by the House of Representatives, three senators got together for the first meeting of the Senate Tea Party Caucus on Thursday. More than 120 activists from groups such as FreedomWorks, Tea Party Express and Americans for Tax Reform were invited to attend. January 26, 2011  The new GOP chief of the House Oversight Committee kicked off the first of half a dozen investigations he's planned for the next three months into the Obama administration. Chairman Darrell Issa honed in on the administration's handling of the financial meltdown. Treasury Department officials defended the bank bailout for Wall Street, but their program for preventing home foreclosures for Main Street was slammed as a failure. The hearing lays the groundwork for GOP plans to repeal some financial regulations and reform the mortgage giants Fannie Mae and Freddie Mac. January 25, 2011  The House of Representatives voted Tuesday to roll back federal spending to 2008 levels, a symbolic vote on the eve of the president's State of the Union speech. January 15, 2011  The shooting attack on Rep. Gabrielle Giffords cast a pall over Capitol Hill this week. But next week, Republicans will return to their legislative agenda. And at their annual retreat in Baltimore on Friday, they talked about how they will do it. January 12, 2011  It's a day of tributes and condolences in the U.S. House, where lawmakers are paying tribute to the victims of last Saturday's violence in Tucson. They are extolling their colleague Gabrielle Giffords, and they're saying lawmakers should remain accessible to constituents despite security concerns -- and perhaps should tone done the rhetoric. January 9, 2011  Rep. Gabrielle Giffords of Arizona, a centrist Democrat, recently won a close victory in her swing district. The attention she gave to her constituents was what allowed her to win, friends say. "People knows she cares," says Don Bivens of the state Democratic Party. 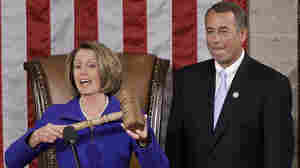 January 9, 2011  The news of Rep. Gabrielle Giffords' shooting has shocked her fellow lawmakers. And it prompted Republicans to postpone all votes scheduled on the House floor, including the pending controversial health care vote. January 6, 2011  The new Congress took oaths of office and swore in new officers with smiles and standing ovations Wednesday. Then they took up arms again to battle over rules changes. The newly Republican-led House is changing budget procedures. The Democratic majority in the Senate may kill secret holds on bills. 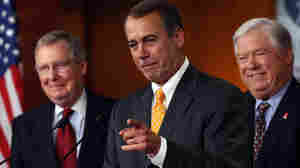 January 5, 2011  Ohio Republican John Boehner was elected Speaker of the House on Wednesday, as dozens of new Republican lawmakers swarmed the Hill with their families -- and the House got down to the business of changing its rules and reining in spending. November 15, 2010  Lawmakers have a long list of items to take up in their lame-duck session, and one of the things they could tackle is a federal program extending unemployment benefits for millions of laid-off workers. It runs out at the end of November. November 3, 2010  Ohio Rep. John Boehner -- who is expected to become the next speaker of the House after Republicans swept to control in Tuesday's election -- has outlasted some of the biggest names in the Republican Party's 10-year roller-coaster ride through changing leadership. October 27, 2010  Republicans expecting to take control of the House next week may dream of repealing health care and slashing spending, but given the president's veto pen (among other obstacles), they're likely to achieve more as oversight watchdogs. And who will these new overseers be? From Darrell Issa on the Oversight Committee, to Dave Camp at Ways and Means, to Lamar Smith at Judiciary, expect to see investigations launched and Cabinet secretaries called in to testify. But wait -- there is a potential obstacle for some of the new chairmen: House GOP rules say you can only serve three consecutive terms as chairman or ranking member. October 21, 2010  House Republicans are out with a video demonstrating how when they're in charge, power will be put back "in your hands." But assuming a GOP takeover, who's hands will the major committees be in, and what changes are ahead in oversight and legislation? October 18, 2010  An investigation by the Center for Public Integrity has found that Republicans who railed against the stimulus bill and Democrats who had crowed that there would be no earmarks later wrote letters to federal agencies seeking a slice of the pie. It's a practice known as lettermarking. 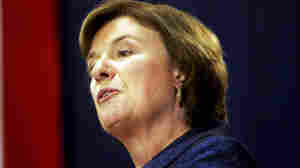 October 11, 2010  Democrat Carol Shea-Porter of New Hampshire sailed into Congress with the 2006 Democratic tide and managed to stay afloat two years later. Now, pollsters are noting a noticeable "enthusiasm gap" among a core constituency for Shea-Porter and the Democrats: women.